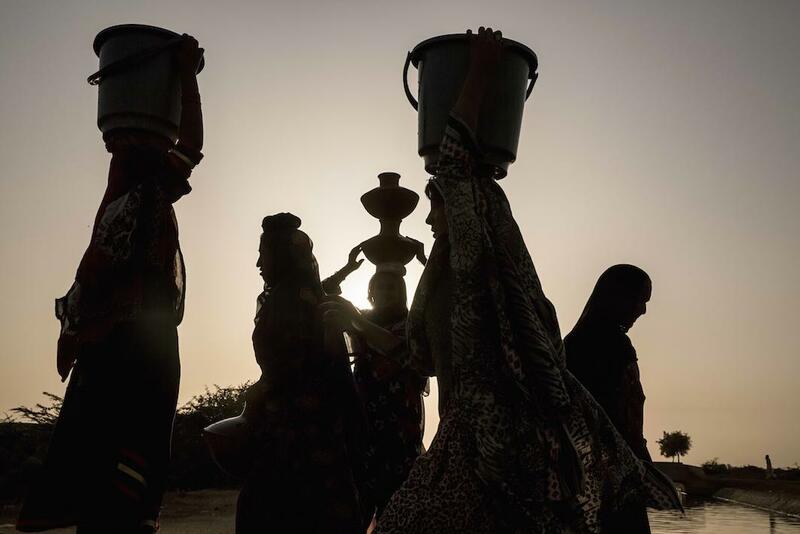 Women collect water in traditional terra cotta pots from the open canal in Noor Muhammad Thaheem. The canal transports drinking water from Keenjhar Lake to Karachi. As temperatures skyrocket this summer, heat-related illness isn’t the only threat to public health. Water scarcity is also a major concern. Rainfall gets scant when the mercury runs high, and according to the Washington Post, ascending sea levels in the Middle East are making groundwater too salty to use for drinking or agriculture. For those living in the Indus River Delta in southeastern Pakistan’s Thatta region, these issues are a daily reality. Water is hard to come by, and many have to spend hours traveling every day to get it from canals connected to Keenjhar Lake. Since the region is near the coast, it’s particularly susceptible to saline intrusion and flooding. In 2010, when devastating floods tore through the country, the Indus Delta was one of the worst affected areas. For two weeks this February, New York–based photographer Malin Fezehai, on a commission from the H&M Foundation and WaterAid, visited the region to document how water scarcity and climate change affect the lives of the area’s poor and marginalized families. Her photos are featured in the exhibition “Noori Tales: Stories From the Indus Delta,” which is on display at Kungsträdgarden in Stockholm from Monday until Sept. 4. 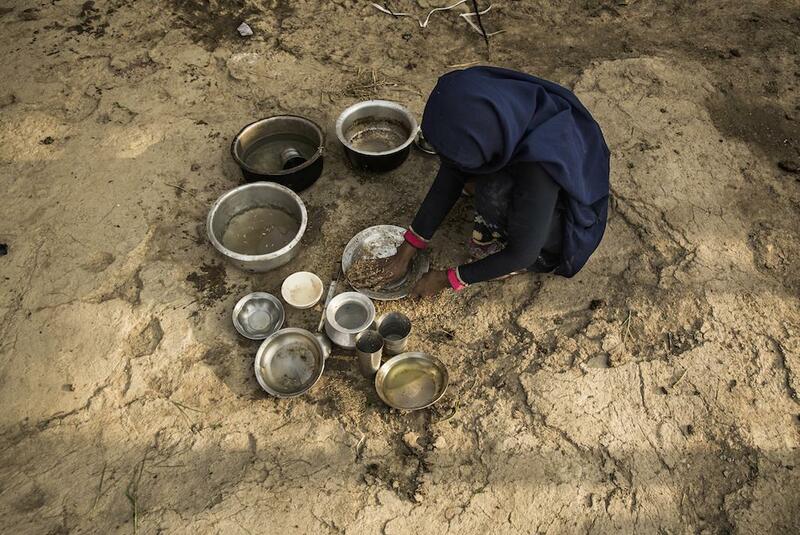 A woman in the water-poor village of Noor Muhammad Thaheem uses sand to wipe her dishes. 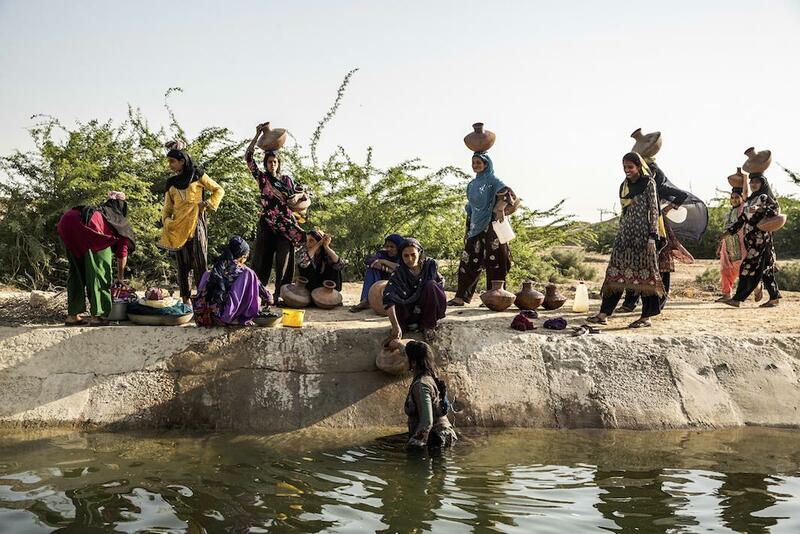 Women and girls doing the washing in a salinated rivulet in Noor Muhammad Thaheem. 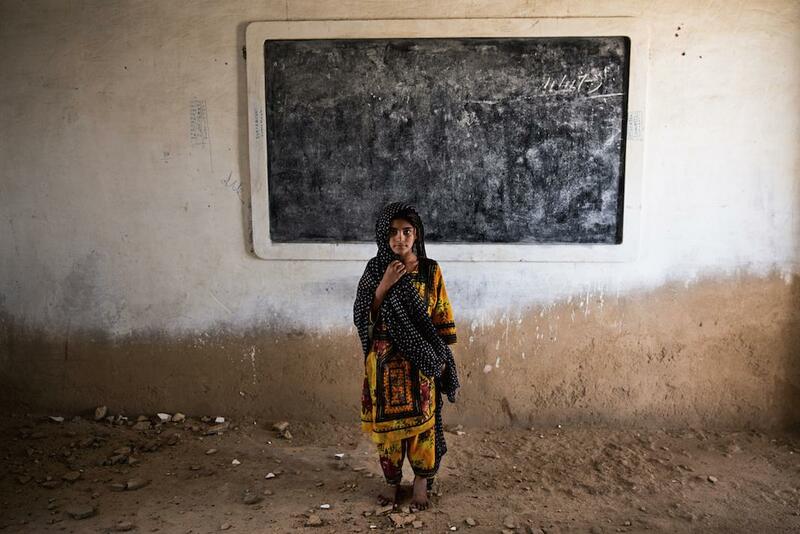 Gul Bano, 6, stands in the ruins of her classroom in Haji Karfoor Jat in 2016. 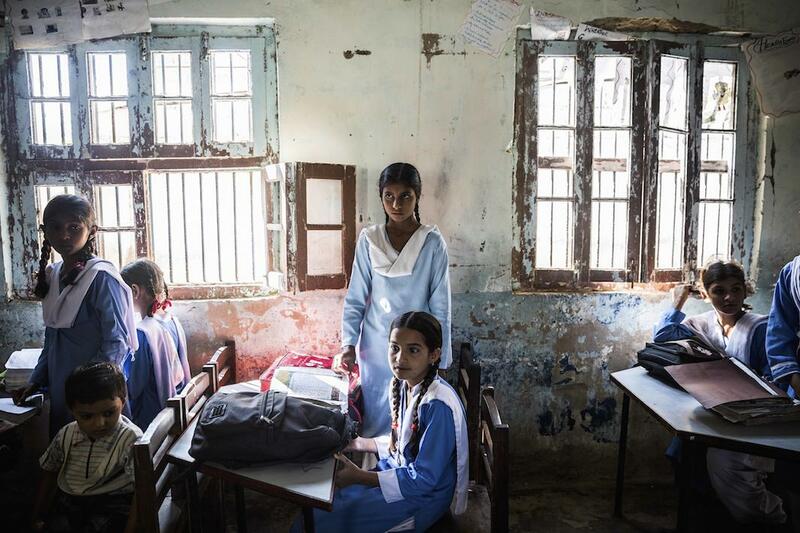 The school’s walls and ceiling are collapsing as they’ve been eroded by saline groundwater and salt winds blowing from the nearby Arabian Sea. 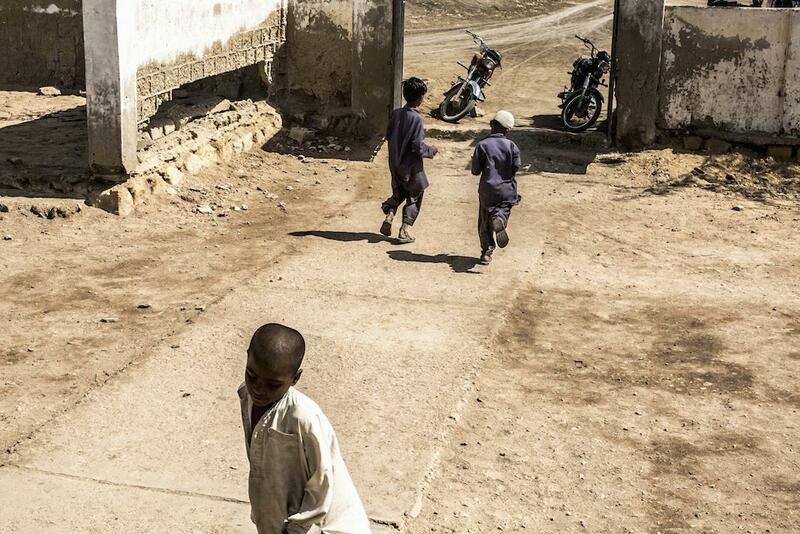 Maqsood, 6, and friends play outside the schoolhouse in Ladia Wah, where the perimeter walls are collapsing from the ground up due to saline erosion. Fezehai’s photos largely focus on the area’s schools, where the H&M Foundation, WaterAid, and National Rural Support Program are building safe drinking water facilities and bathrooms designed to be resistant to flooding and saline erosion. In the past, the absence of these kinds of facilities has kept many students, particularly girls, from staying in school or even enrolling in the first place. Erosion from increasingly salty groundwater, meanwhile, has caused walls and ceilings in some of the schools to collapse. “The saline intrusion is caused by a combination of factors. It’s barrages on the river upstream, the destruction of mangroves downstream, and it’s both of these being driven by climate change at the global revel,” said Louise Whiting, a policy analyst for water security and climate change at WaterAid. Fezehai spent her days photographing young students at school and at home across the region. She illustrated how, in areas where the drinking and sanitation facilities had already been built, life was beginning to get slightly easier. In areas where the facilities had not yet been built, her photos underscored the challenges of daily survival and the urgent need for aid. In both cases, her photos show people making do, however they can, with what they have. “When you talk about water scarcity, you always want to personalize the issue and show what it means for the people on the ground—put faces to the numbers,” Fezehai said. Girls await the start of lessons at the primary school in Chaudury Atta Muhammad village in 2016. Before the H&M Foundation–funded facility was built, the girls had nowhere at school to access safe water or go to the toilet. Attendance has increased since the block was built, as parents have greater confidence in the security and safety of their girls when they don’t have to leave the school compound to find a place to go to the toilet in the open. 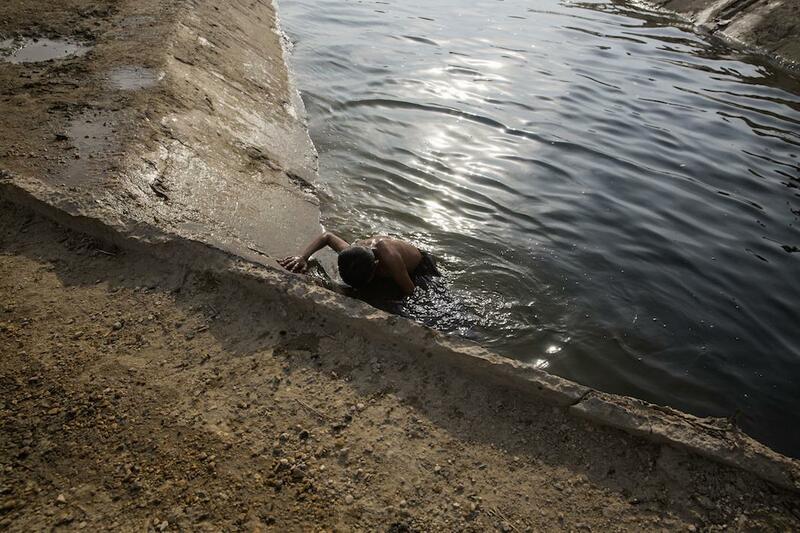 A boy climbs out of the canal after a swim in Noor Muhammad Thaheem village in 2016. The canal, which supplies water to Karachi’s 16.6 million residents, is the only source of nonsaline water accessible to villagers. Untreated water from the open source is used for everything from bathing to cooking and drinking. 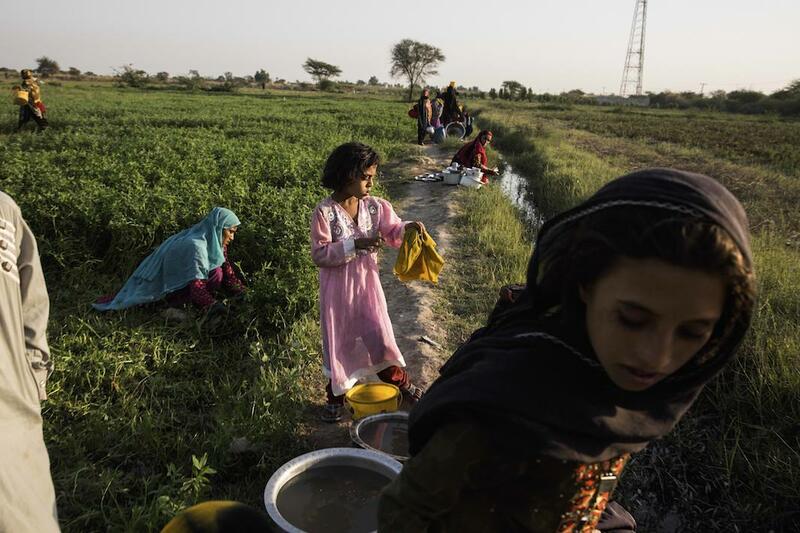 Women carrying water from the canal in Noor Muhammad Thaheem. Though water from the canal is still used at home, the children here now have access to safe water at school as result of the H&M Foundation–funded water and sanitation block constructed by WaterAid. 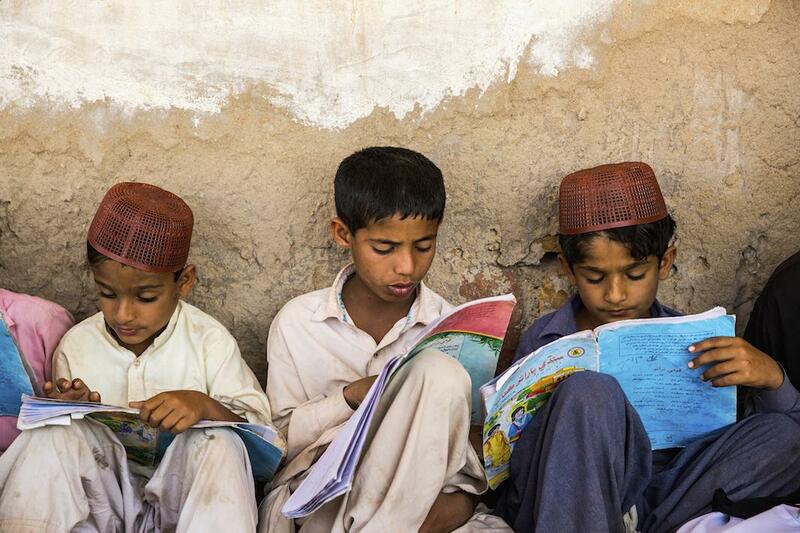 Boys study outside the school in Haji Karfoor Jat. Though the main building is currently unsafe, the teacher has applied for funding from the local government to rebuild it, and WaterAid will soon be building a water and sanitation block that is resistant to flooding and saline erosion.